Chapter 1. Fundamentals. The Basics of Electrode Reactions (E.J. Calvo). Introduction. General. Simple electron transfer. Multiple electron transfer. Theoretical treatments. Effect of adsorption at electrodes. Electrocatalysis. Mixed potentials and corrosion. Electrocrystallization. 2. Mass Transport to Electrodes (K.B. Oldham and C.G. Zoski). Introduction. Modes of transport. Preliminary considerations of the experiment. Finite planar geometry. Semi-infinite geometry. 3. Linear Sweep and Cyclic Voltammetry (V.D. Parker). Introduction. Theory of LSV and CV. Experimental aspects of LSV and CV. Electrode kinetics. Homogeneous chemical kinetics. Detailed analysis of linear sweep voltammetry waves. Applications. Concluding remarks. 4. Alternating Current and Pulse Methods (M. Sluyters-Rehbach and J.H. Sluyters). Introduction. The mathematics of relaxation methods. On the praxis of large and small amplitude relaxation methods to the study of electrochemical processes. Elucidation of mechanisms of electrode reactions by means of zeroth-, first- and second-order relaxation methods. Zeroth-, first-, and second-order parameters. Multi-step mechanisms with stable intermediates. Reactant adsorption. Kinetics of homogeneous chemical reactions coupled to electrode reactions. 5. Hydrodynamic Electrodes (C.M.A. Brett and A.M.C.F. Oliveira Brett). Introduction. Mass transport. Experimental. Application of hydrodynamic electrodes to electrode kinetics. The application of hydrodynamic electrodes to the study of electrode processes with coupled homogeneous reactions. Transient techniques at hydrodynamic electrodes. Hydrodynamic electrodes and spectroscopic techniques. (References are included in each chapter). Index. Volumes 26 and 27 are both concerned with reactions occurring at electrodes arising through the passage of current. They provide a comprehensive review of the study of electrode kinetics. The basic ideas and experimental methodology are presented in Volume 26 whilst Volume 27 deals with reactions at particular types of electrodes. 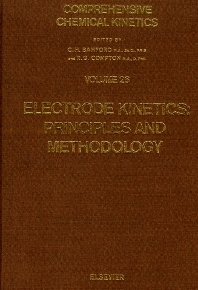 Chapter 1 serves as an introduction to both volumes and is a survey of the fundamental principles of electrode kinetics. Chapter 2 deals with mass transport - how material gets to and from an electrode. Chapter 3 provides a review of linear sweep and cyclic voltammetry which constitutes an extensively used experimental technique in the field. Chapter 4 discusses a.c. and pulse methods which are a rich source of electrochemical information. Finally, chapter 5 discusses the use of electrodes in which there is forced convection, the so-called hydrodynamic electrodes''.